Storks have long been associated with Alsace, and these days they're making a comeback. Storks have been part of Alsace for centuries, and they are thought to be symbols of happiness and faithfulness and bring fertility and good luck—after all, who else delivers all those babies? They appear in various legends and folk tales from the region. But in the 1970s the stork population in Alsace was threatened, with only a small number of nests reported. 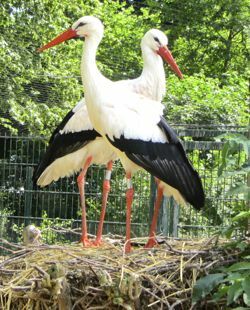 Traditionally the storks would migrate from Africa, where they spent the winter, and come to Alsace in the summer. A variety of factors, from weather to power lines to hunting and eating them, led to their decline. In 1983 France started a program to repopulate the storks in Alsace, and it has been very successful. Today you see storks nesting on chimneys and rooftops and in trees, even in cities like Strasbourg. 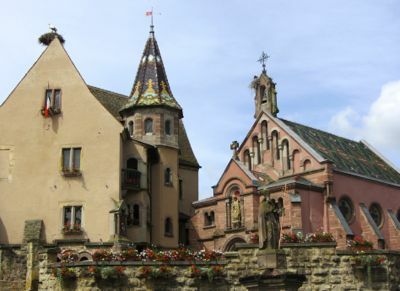 Some small wine villages, like Eguisheim, also play host to growing numbers of storks. Storks' nests on the Eguisheim Castle and church in Alsace. In Strasbourg, the Parc de l'Orangerie has a center for reproduction, repopulation, and wintering where you can see storks up close. Another facility in Hunawihr, northeast of Colmar, is a center for reintroduction of storks. With these efforts, many storks now stay in Alsace year round. Storks are mute, but they communicate by clattering their bills. This can be quite loud and interesting to observe. Storks have also proven a financial boon to the region in other ways, with numerous stork souvenirs and stork-decorated items for sale in shops throught Alsace! Alsace is not the only area that protects its storks. The small town of Selçuk Turkey, near the famous Roman site of Ephesus, is also known for its storks. Above, A double take? Storks in Strasbourg. 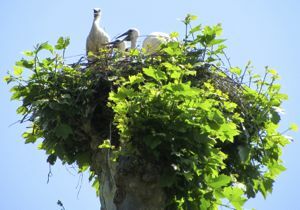 Below, Storks in a nest, Parc de l'Orangerie, Strasbourg.